Defenseman Darnell Nurse of the Sault Ste. Marie Greyhounds in the Ontario Hockey League has been surrounded by athletes his entire life. It's no wonder he's privy to all the hype that accompanies the spotlight of his chosen future profession. Nurse is No. 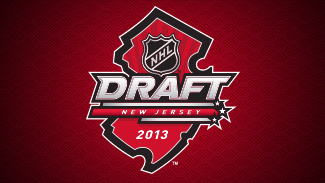 4 on NHL Central Scouting's final ranking of North American skaters eligible for the 2013 NHL Draft. In NHL.com's most recent mock drafts, he's expected to be a top-10 selection, with one expert predicting he'll go in the top five. One of the things he's learned from his uncle -- former NFL quarterback Donovan McNabb -- is the importance of training and staying physically fit. The Florida Panthers will have the best odds heading into the 2013 Scotiabank NHL Draft Lottery, to be held Monday in Toronto (8 p.m. ET, NBCSN, TSN). For the first time, all 14 teams that missed the Stanley Cup Playoffs will have the opportunity to win the No. 1 selection. The odds of winning remain the same from years past. The Florida Panthers, who finished 30th in the League standings, have a 25.0 percent chance of picking first. The Colorado Avalanche have the next-best chances of winning the first pick, at 18.8 percent, followed by the Tampa Bay Lightning (14.2 percent), Nashville Predators (10.7 percent) and Carolina Hurricanes (8.1 percent). No team can move down more than one spot, so the Panthers are guaranteed a top-two selection when this year's draft is held June 30 in Newark, N.J. Here are the odds for each team to win the draft lottery. The Edmonton Oilers have won it the past three years. "From a physical standpoint, being able to work out with guys who've been through the experiences, as well as being in a house with so many competitors, is great," Nurse told NHL.com. "But the three biggest people, to be honest, are my parents [Richard and Cathy] and Uncle Donovan." McNabb spent 13 seasons in the NFL, including 11 with the Philadelphia Eagles. McNabb is Darnell's uncle by marriage. "[Darnell's] the guy that's willing to do whatever it takes in order to be the best," McNabb told Dave Isaac of the Courier-Post [Camden, N.J.]. "He has a chip on his shoulder all the time. I've always tried to instill in him great work ethic and to have pride and passion in everything you set out to do. He continues to work hard, to be determined to be No. 1 at all times. It's also important for him to understand that there's nothing wrong with failing because you learn from your mistakes. It only makes you stronger mentally. It will better you in the future." Nurse, the No. 2 defenseman in the final rankings, said he is grateful McNabb has taken him under his wing. "My uncle has always been there for me," he said. "No matter if I had a question being away from home for the first time or working out over the summer. He's been someone I've always been able to reach out to … he's a big person in my life." Nurse was asked if McNabb has become a hockey fan knowing how popular his nephew suddenly has become. "He's growing to be one," Nurse said. "I think over the years he's actually been watching a lot more [hockey], and is really interested in what I'm doing. He hasn't put on a pair of skates yet, but I'm pushing him." There's a chance Nurse could be picked by the Philadelphia Flyers when this year's draft is held June 30 at Prudential Center in Newark, N.J. How does McNabb think his nephew would embrace the same city in which he rose to prominence? "One thing for him I think people should understand is that this kid is way beyond his years," McNabb said. "I would tell him it's not just Philly. It's anywhere you play -- you have to focus in on your job. If you focus in on your job and do whatever you need to do to help the team win, that's what fans want to see. They want to see someone who's going to work extremely hard, put in the time and effort and get out on the ice and get good results. That's what he's all about. "We had great fans in Philly and they're still great fans in Philly. He understood that and he understood that I enjoyed playing in Philly. But whether he goes to Philly or anywhere else, your focus has to be on what you're asked to do and that's to entertain and make sure you help the team win." NHL Central Scouting's Chris Edwards compared Nurse to a young Chris Pronger. Pronger spent two seasons in the OHL with the Peterborough Petes before being selected by the Hartford Whalers with the second pick of the 1993 draft. In his second season with Peterborough, Pronger had 15 goals, 77 points and 108 penalty minutes. In his second OHL season, Nurse had 12 goals, 41 points, a plus-15 rating and 116 penalty minutes. Nurse said he enjoys the comparisons to Pronger, but realizes he has a long way to go to get to that level. "I think people like to compare young players to NHL players to get an idea what they could potentially be down the road, and to be mentioned in the same breath as Chris Pronger is something that a lot of people dream about," Nurse said. "At the same time, you have to understand you are your own player. You have to do what you need to do to be successful. Pronger has been a big player in the NHL and comparisons to him put a little added pressure." How Nurse will react in the face of pressure against the top forwards in the world as Pronger has done throughout his career is one thing, but McNabb has faith in his nephew. "The kid is remarkable and one I enjoy being around because he's passionate," McNabb said. "Everything about him is truly passionate and he's the best at what he does. "I've never got on skates in my life but I know if I got on skates with this kid, who is a remarkable athlete and a great hockey player, he'll try to chuck me into the glass and I'll have to beat him down."